Voinovich was Cleveland's mayor from 1980 to 1989, currently the last Republican to hold that office. He went on to become governor, then senator, of Ohio. I miss him because he was so darned interesting. I miss him because he was the consummate micro-manager. He was the kind of fellow who, as I wrote of him in 1997, "if you ask him what time it is, he will tell you how to build a facsimile of the atomic clock at Greenwich." I miss him because he had a well-deserved reputation as a penny-pinching tightwad, who once banned snacks from state airplanes when he found out they had been bought with public money. And he once famously plucked a penny out of a public urinal, washed it off, and stuck it in his pocket – he couldn't stand to see money go to waste. He was a Republican, through and through, but he was popular enough that he could thumb his nose at the Republican Party establishment whenever he disagreed with them. Voinovich had one thing they never had and never would – the ability to deliver the Democratic fortress of Cleveland in a statewide election. Part of it was his appeal to the Cleveland area's many ethnic voters, particularly those with roots in Eastern Europe. He himself was the son of a Serbian father and a Slovenian mother, and his grandparents had immigrated to the United States from what is now Croatia. He was in his element at his last public appearance, making a speech at a Slovenian Independence Day event – only two days before he passed away in his sleep at his Cleveland home. Before becoming governor he was mayor of his hometown for 10 years, where he personally dragged Cleveland from the brink of bankruptcy and into a new age of development. He was so popular among his hometown folks that the GOP establishment was more than willing to tolerate him. What other Republican could win over Cleveland's Democratic voters in those days? 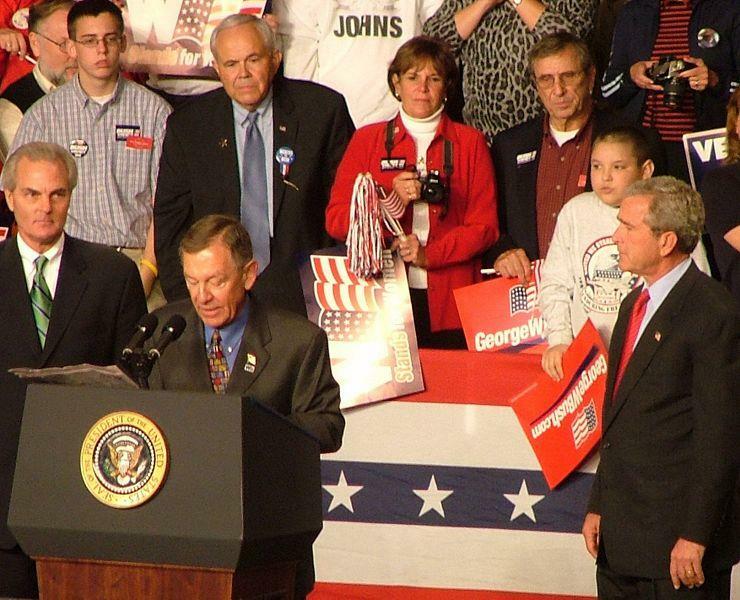 George Voinovich introduces a soon-to-be re-elected George W. Bush during a 2004 campaign rally in Ohio. He had known tragedy too – in 1979, when he was running for mayor, his 9-year-old daughter, Molly, was killed when she was hit by a van that went through a red light. George and his wife Janet had four children – Molly was the youngest. He and Janet were one of the most devoted couples I've ever seen in politics. When they were in public together, they were almost always holding hands. They ended up with a large brood of grandchildren, and the entire Voinovich family was always featured on the Christmas cards they sent out. I was the politics writer at the Cincinnati Enquirer during his years as governor and in the Senate. We had a good relationship, although things would get a bit rocky at times. When he was wrapping up his second term as governor and thinking about running for the Senate, word got back to me that he didn't much like a column I had written saying I didn't think Voinovich, after being a big city mayor and big state governor, would much like the Senate. In the Senate, I wrote, Voinovich wouldn't be the boss as he was as mayor or governor; he'd just be one of 100 senators who thought they were boss but weren't. About that time, Voinovich held an early campaign event at Memorial Hall in Over-the-Rhine, where the local Republican party turned out the courthouse crowd and the place was packed. He and Janet, along with a phalanx of aides, Highway Patrol security officers, and a host of reporters, exited the building by walking down the steps behind the stage; it was the quickest way for him to get out and get to his waiting state SUV parked behind Memorial Hall. I was about six steps above him and I started yelling out a question to him – I forget what it was about, but I'm sure it was important at the time. He stopped dead in his tracks on the steps, turned around and looked me in the eye. He stopped so quickly, the momentum almost sent the whole crowd tumbling down the steps. Then he started making a motion with his arms, like the witches in MacBeth stirring their caldron. "Always stirring the pot, aren't you, Wilkinson? Just stirring the pot! Can't leave it alone! Just stir the pot!" Janet took him by the arm and started leading him down the steps. Everybody in the press corps, including me, got a good laugh out of that one. As I say, I can't remember what it was all about, but I probably deserved it. 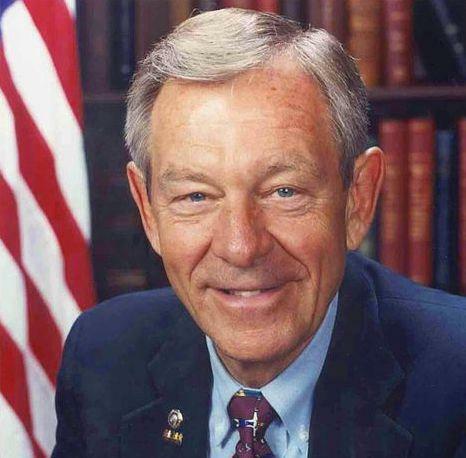 As governor, Voinovich was absolutely dedicated to trying to sell Ohio as a tourist destination, from Lake Erie to the banks of the Ohio River. He hosted events where travel writers from around the country would be invited for a tour of the state. 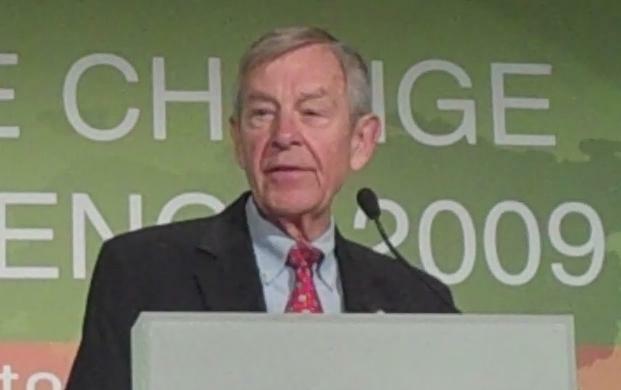 Then-Senator Voinovich at a 2009 event. Once he brought a group to downtown Cincinnati. He had a prominent Cincinnati Republican politician, Ohio Senate president Stan Aronoff, along for the ride. One of the stops was at the Skyline Chili parlor on E. Fourth Street downtown. The whole mob of reporters, photographers, staff and politicians crowded into the Skyline. The management put the governor and Aronoff in aprons and sent them behind the steam table. Here was the photo op of the day: the governor of Ohio and the president of the Ohio Senate learning to construct cheese coneys and three-, four-, and five-ways. After a little instruction from the real Skyline staff, Voinovich and Aronoff went at it. Voinovich, a Cleveland boy, would probably have been more comfortable making pierogis than five-ways, but he was a gamer. He shouted over to me. "Howard, what do you want? Don't worry; I can handle it!" I was a bit dubious but I decided to play along. "How about a four-way, Governor?" Immediately, he grabbed a plate and started slinging chili, spreading chopped onions and tossing around shredded cheddar cheese. "Here you go! How's that?" I didn't tell him, but it was a hot mess. It was a mish-mosh of stuff that looked like it had been run over several times by a pick-up truck. Yeah, that's great, Governor... You're getting the hang of it. I surreptitiously ditched the mess on an empty counter; I didn't want to hurt the man's feelings. He seemed very proud of that four-way. You couldn't help but like the man. I remember once when he was in the Senate, he stopped by the Enquirer for a chat with the editorial board. I wasn't a member of the editorial board, didn’t want to be. But they would invite me to sit in on their interviews with politicians. Voinovich was doing a discourse on the national debt, one of his favorite subjects, and he went on and on and on until all the eyes in the room were beginning to droop. If he had kept it up, the entire editorial board would have been fast asleep. "Well, I suppose I should stop talking. If I don't, Wilkinson here will write a column saying I talk too much." He looked at me and gave me that big, infectious grin of his – the kind that could charm even the hardest cases. After the session, the governor and I were walking out of the conference room and heading to the elevator and we started talking about fishing. Aside from his family, there was probably nothing Voinovich loved more than to get in his beat-up old boat and cruise up and down the shore of Lake Erie fishing. I had worked in Painesville in Lake County just after getting out of college, just east of Cleveland on Lake Erie. And, like Voinovich, I loved fishing. I started telling him about a fishing spot I knew about in Lake County where the yellow perch were always jumping – near Fairport Harbor, in the mouth of Grand River, a tributary of Lake Erie. Voinovich became very interested. He pulled a piece of paper out of his pocket, grabbed his pen and started writing: Mouth of Grand River. Perch. Fairport Harbor. We left the building and parted ways; he had other places to be and other things to do than stand around talking fishing with me. A few weeks later, though, the phone rang at my desk. "Howard, it's George Voinovich. Just wanted to thank you for that fishing tip. It was fantastic! I had perch jumping in the boat! I owe you one!" I said, "No, you don't owe me. This one's on me. Unless you want me to come up sometime for a fish fry. Glad you enjoyed it." "Well, just wanted to say thanks. 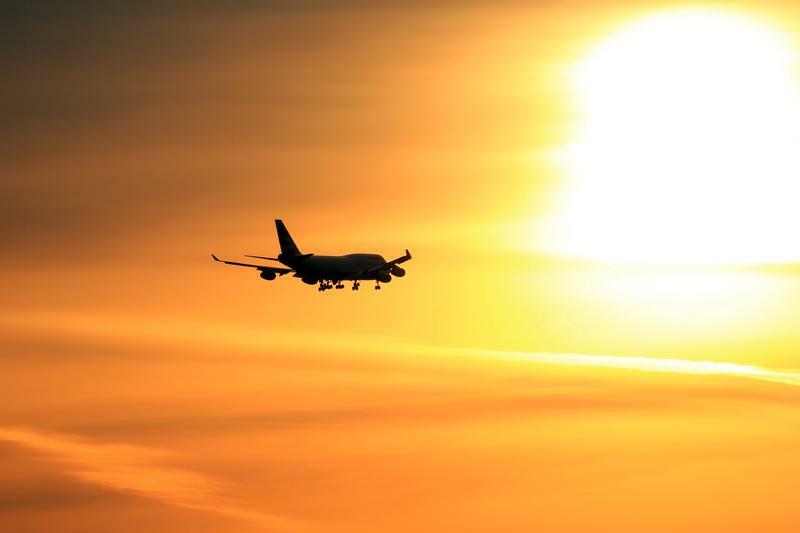 See you around." Who knows what important state business he had put aside for a few minutes to thank a reporter for a fishing tip? Yes, I miss the guy. How could you not?